- The Dark side is like a simplified “best of” by Cooper FX. - MOD will give you the video-glitching sounds known from their Generation Loss pedal at higher modify settings, feel free to experiment with an expression pedal or ramping! - BLACK is an infinite loop, I recommend you start with Decay at minimum and Modify is then the level of the sampling loop. Higher decay settings will determine how hard you have to play to overwrite what’s running in the sampling loop. - SHIM is another type of sampling, and you can add a -1 octave (Modify at 0) or +1 octave (Modifiy at 10) in. Modify at noon means no pitch shifting. - If you like ramping parameters, I’ve had interesting results with ramping tone, predelay (chorus/ pithshifting) and/or modify in MOD and SHIM modes. - You can do really interesting things with an expression pedal too, like adjust the level of the sampling loop (Modify in Black mode), control the Dwell on the world side together with Tone, etc. this probably is sold as an DUAL reverb. but you get WAY MORE then just a Reverb. sure it is limited in its options, but the options it come with - just mindblowing. all 3 a high standard. 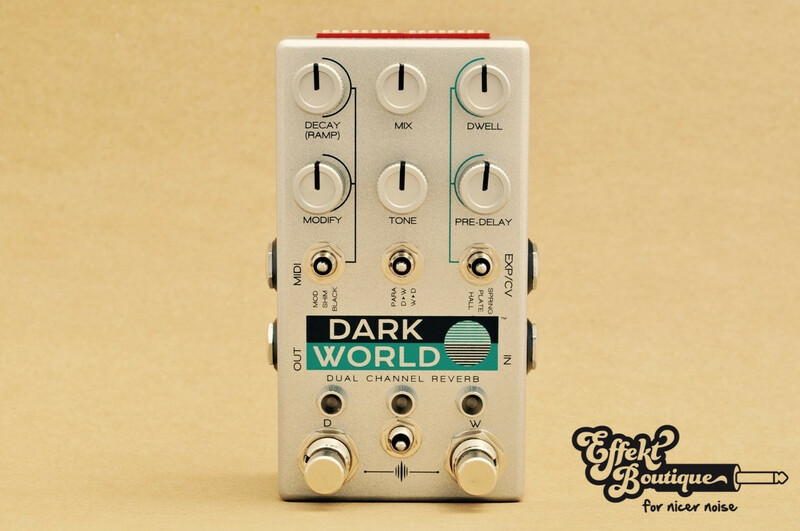 now Dark World joined the Reverb family - and it is and feels totally different then the above named. not only each single algorithm is awesome but combining then, routing them in different directions, adding the crazyness of the Dip-Switches, ramping all the functions - makes the Dark World for me so much more then only a mono reverb pedal. it's a modulation maschine. true thing. if you can get your hands on it - get it now!! !